The Low Flow Water Package is the solution to insufficient flow from your well pump system or municipal water supply. 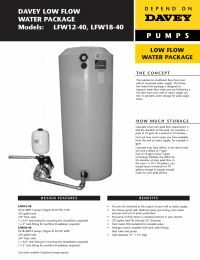 The low flow water package is designed to improve water flow when you are limited by a low flow from your well or mains supply system. It provides water storage for peak usage times. The Davey or Grundfos pump will give you strong, even water pressure and loss of prime protection. No pump cycling means a constant pressure in your shower. 200 gallon tank, 31" x 72", UV stablized for outdoor use. Green tank color reduces algae growth. Tank meets FDA standards for potable water. Package comes complete with tank, tank fittings, float valve and pump. Calculate what your peak flow requirement is and the duration of the peak. For example, a peak of 10 gpm for a period of 10 minutes. Find out how much water you have available from the well or mains supply. For example 3 gpm. Calculate your total deficit, in the case above we have a deficit of 7 gpm (10 gpm minus 3 gpm incoming). Multiply the deficit by the duration of your peak flow, in this case 7 x 10 = 70 gallons. You would need a minimum of 70 gallons storage to supply enough water for your peak period. NOTE: The Low Flow Water Package is a special order item and no exchanges or returns are allowed on this item. This item can only be shipped via LTL Carrier, so shipping rates may be adjusted after check out.